It’s been almost 1 year since I’ve submitted my PhD project. Now I’m waiting for the graduation ceremony in this Dec. YAY!!! I planned to start doing a new project from this year but I haven’t started it yet because there’re so many things to be done by end of May. But I will try to start doing a new project asap. Also I should keep writing blog entries as well. FOR SURE!! Digital Ppal-let-ter is a new digital space where the wash place before the 1960s and a Kakao Talk group chat room in 2015 coexist together. As an imaginary space that has been planned and created based on interdisciplinary research and creative concept of thinking, I have carefully considered how to present the concept of Digital Ppal-let-ter to audiences. Initially I planned for Digital Ppal-let-ter to be exhibited in a gallery or other space in the form of an installation. However, the plan changed to using video due to the difficulty of installing a reproduction of a wash place and the Kakao Talk group chat room. Through the video, the audience can experience the wash place prior to the 1960s with village women and a Kakao Talk group chat room in 2015 with Smart Ajummas at the same time. The project will also encourage audiences to reconsider the communal spaces, the ways of communication and the communities of middle-aged married women, ajummas, in Korea from the past to the present. Furthermore, it can be expected that this opportunity will increase interest in ajummas and their ways of communication among audiences and the general public. Hence, both the creative project, Digital Ppal-let-ter, and the research project, Smart Ajumma, will awaken thoughts and value about the existence of ajummas and their unique way of communicating that has gone unnoticed. Digital Ppal-let-ter (Wash place) from Jung Moon on Vimeo. Through various and deeper ways of study such as an academic research (e.g. literature research) and qualitative/quantitative research (survey and deep focus group interview), I could realise and identify who ajummas are and their behaviour of mobile communication through using smartphones in their daily lives. Digital Ppal-let-ter project is a part of Smart Ajumma research project that expresses my research findings and interpretations metaphorically through a video humorously but the stories are still based on academic research in order to avoid losing the purpose of this research project. I was amazed through enjoying this research project for last few years. Ajummas in Korea, they actually have their own communal spaces and keep doing communication with each other by their own ways. We didn’t know about their communal spaces and their ways of communication because we just stared at them rather than looking inside deeply. After I found that there are communal spaces for ajummas’ own through doing field research, I could keep continuing this creative research project. And I thought about Ppal-let-ter (wash place)! Of course, there are many countries had wash places but a wash place in Korea can be considered as a characteristic place than other countries’. As I mentioned so many times, a wash place in Korea is more likely a women’s communal space before 1960s. There are sill wash places in Korea but those places haven’t been used as a wash place for a long time. They rather became tourist spots today because we have washing machines at home to do our laundry instead of going to wash places regularly. Whereas, going to the wash place regularly was a matter of course for village women (or ajummas) not only doing their laundry, but also meeting other village women (or ajummas). In other words, the wash place was a place for ‘socialising’ and ‘communicating’ for middle-aged and married women in Korea during 1960s. They don’t have an appointment with each other, but they could meet someone whenever they visit the wash place. So it was possible to have conversations with each other about various topics from complaining patrilocality to boasting their children. The wash place functioned as more than ‘wash place’, rather it played a role as a women’s communal space. Thus, I got inspired by this important but being forgotten wash place to start doing my creative project so called as ‘Digital Ppal-let-ter’. Even though there are various types of women’s communal spaces such as hair shops and jjim-jil bang (sauna), the reason why I chose a wash place as a key space to do my creative project is because I thought a wash place is one of women’s communal spaces and it has sentiments of Koreans and Korean culture. In the late 18th century, ‘the wash place’ by Hong Do Kim shows how a wash place in Korea could be a women’s place even though there were no law and regulations that prohibited men from coming to a wash place. Through survey and focus group research, Kakao Talk’s group chat room was the most preferred way of mobile communication among ajummas. Some of interviewees responded that they purchased smartphones only for using Kakao Talk’s with their friends and family. Like this, Kakao Talk’s group chat rooms were now newly used as communal spaces or the ways of communication today. These two dissimilar places that came from totally different time are very much similar with each other. This makes me so exciting. Digital Ppal-let-ter = A communal place for Ajummas? These two places are dissimilar, it is so true. However I realised that they are very much similar with each other at the same time. We’re now using smartphones and the use of smartphones allow us to do many things that we never imagined in pre-smartphone era. I think ajummas in Kakao Talk’s group chat room and their communication in mobile space are not an entirely new things that could be possible due to the development of new technologies. Maybe, they’ve been communicating with each other in their own communal spaces by their own ways of communication. In other words, the wash place in the before 1960s was not disappeared at all, rather I consider the wash place continues to exist with us in the shape of Kakao Talk’s group chat room. We’re now using different communicative tools and methods. And we’re communicate in dissimilar communal spaces compared with pre-smartphone era. Even though many things had been changed, we shouldn’t forget one thing that middle-aged and married women in Korea have been communicating continuously regardless communicative tools, methods, time and spaces. Digital ppal-let-ter in the future? Digital Ppal-let-ter is not a new thing at all. It is a women’s communal place today. The communicative method (from face-to-face to mobile communication), communicative tools (from direct dialogue to smartphones) and communal spaces (Ppal-let-ter (wash place) to Digital Ppal-let-ter (Kakao Talk’s group chat room) are changed, I expect that communication among ajummas will be evaluating continuously with their own ways. Thus, a discovery of Digital Ppal-let-ter is very important and it must continue to research how this Digital Ppal-let-ter will developing or changing in the future. 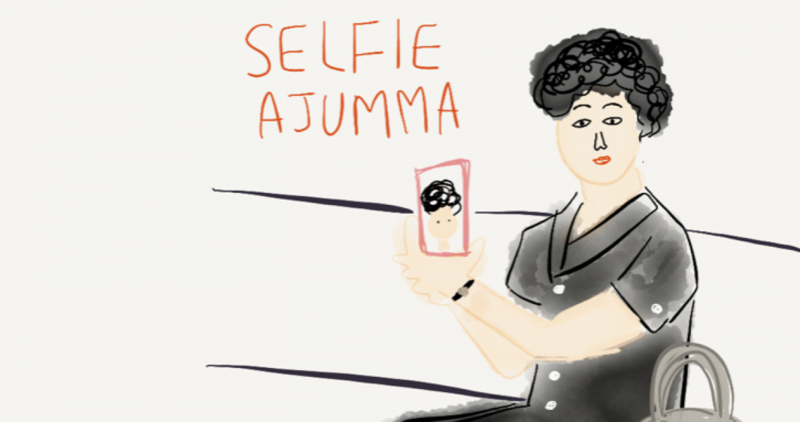 We shouldn’t be overlooked ajummas in new media and communication research. They’re one of unique female group in Korea and we’re ready-to-be ajummas in the future as well. How the idea of wash place can be applied to the research project of Smart Ajumma? Wash place is rather relevant to link to the concept of mobile communication in Kakao Talk group chat rooms by ajummas through the usage of smartphones. A space of wash place is regarded as the equals of Kakao Talk group chat room. And both village women before the 1960s and ajummas in 2015 take the same duty of various houseworks for their family such as washing clothes. In addition, several similarities were found between village women of wash place before 1960s and ajummas of Kakao Talk group chat room in 2015. Here are 6 similar points that were discovered. 1. Tranformation: transformable spaces depending on the purpose. 6. Pop-up communication: they don’t have an appointment for the meetings but they know they can meet with each other in the wash place and Kakao Talk’s group chat rooms. The other five similarities between Kakao Talk’s group chat room and the wash place were mentioned many times in previous posts. So I don’t mention about the other five similarities between Kakao Talk’s group chat room and the wash place in this post.